High in the wall of a Rotherhithe tunnel shaft, just above the world’s first tunnel beneath a river, just to the left of a modern electric junction box is a small black grill gate. Through that gate, so the story goes, a man was rescued from the raging waters beneath which had breached the tunnel during its construction in 1828. Six men drowned. Two had made it to the stairs but were sucked back down by the force of the water. But the rescued man was sent to Bristol for rehabilitation. The young man was Isambard Kingdom Brunel who, along with his father, Sir Marc, had brought the “eighth wonder of the world” into being – the Thames Tunnel, first tunnel beneath a river. That chamber, so long inaccessible, has now been opened as a uniquely evocative museum exhibit – the walls are still black with soot – and a performance space. Brunel Museum director Robert Hulse, said: “This huge chamber, which weighs 1,000 tons, was built above ground and sunk under its own weight into the soft earth. So it’s like a massive pastry cutter but to engineers it’s the world’s first caisson and Brunel was the first person to understand that the best way to build below the ground was build above the ground and sink it. Brunel, ever the showman, made the most of his engineering marvel laying on the world’s first underwater concert – and so it is fitting that the sound of music will once again echo round its blackened walls.. 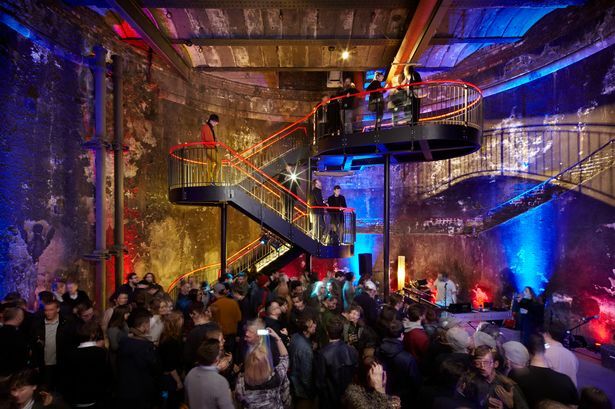 The space now has a free-standing staircase – its shadow crosses the line in the wall where the original worked its way down to the tunnel below where the trains rumble through to this day.